The 80’s brought the release of the best-selling albums, Golden Time of Day, Inspiration, Joy and Pain, containing a list of chart-topping singles including “Travelin’ Man,” “Feel That You’re Feeling,” “Joy and Pain,” “Look in Your Eyes” and “Southern Girl,” to name a few. The group gained worldwide appeal with its legendary sold-out live appearances, and released the deluxe album Live in New Orleans which captured the energy, excitement and electricity of a Maze stage show and offered a fourth side of new studio material which included the hit single “Running Away”. In 1983, with the release of We Are One, Frankie Beverly & Maze solidified their international standing with such hits as the title track “Never Let You Down”, “I Love You Too Much” and “Love is the Key.” As the 80’s came to a close, the group released Can’t Stop the Love and a second in-concert package, Maze Featuring Frankie Beverly Live in L.A., which served both as a retrospective of the group’s remarkable career to date and a fitting close to the first chapter of the Maze legend. 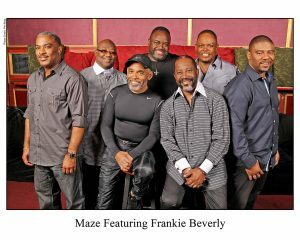 With a change of record label and shifts in the group’s line-up a new era was launched for Frankie Beverly & Maze. “We wanted to emphasize our strengths, bring together the elements that have always been a part of our music and really focus on them,” continued Frankie. The band released Silky Soul, one of their most successful albums, which included the smash singles, “I Can’t Get Over You” and the title track. The group won the prestigious Trumpet Lifetime Achievement Award in 2010 and in 2012 the long awaited BET Cadillac Lifetime Achievement Award. They continue to attract sold-out audiences shedding a long lived title of “best kept secret in the industry”.